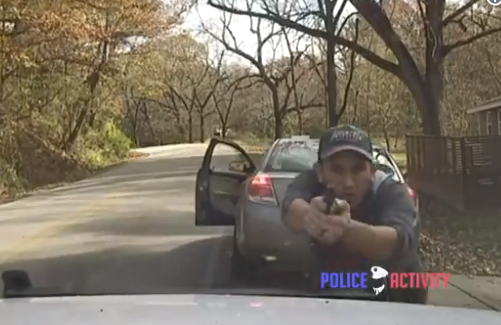 Arkansas – an illegal alien was caught on police dash cam ‘allegedly’ shooting at an officer after being pulled over Sunday for a traffic violation. Washington County Cpl. Brett Thompson attempted to pull over a green Saturn at about 5:43 p.m., but as soon as he exited the patrol vehicle, the driver opened fire. Then the suspect fled the scene. Luis Cobos-Cenobio, 29, was eventually arrested and faces charges of attempted capital murder, one charge each of fleeing, terroristic act, possession of a controlled substance and possession of drug paraphernalia. He is being held on a $500,000 bond. This suspect meant business. When you look at the video, you can see that he not only shot at the police officer from his own driver’s side, he came out of the car and walked toward the police car, shooting all the way. Cobos-Cenobio eventually stopped the car on Steele Road. When Thompson got out of his patrol vehicle, Cobos-Cenobio opened his car door and began shooting, at which point Thompson returned fire, according to a news release from the sheriff’s office. Cobos-Cenobio fled, then stopped a short distance later and let a female passenger out of the car before taking off again. A Springdale police officer spotted the car at 1:11 p.m. north of Lake Fayetteville. Cobos-Cenobio again shot at officers, according to the Springdale release. The Fayetteville Police Department and Arkansas State Police joined the chase that went into Fayetteville and back to Springdale. Cobos-Cenobio stopped the car and surrendered to police. (ICE) Immigration and Customs Enforcement has a hold on Cobos-Cenobio, but with the charges in place, it will be some time before he’s out so they can have him.